Click to review Script Tutorials & Downloads. Consolidate many tasks into one automated routine that eliminates the potential for error. Use BIOPAC Basic Scripting to customize the display and simplify the user interface. Labs repeat the same procedure many times across multiple subjects and with the use of scripting it is possible to consolidate many tasks into one automated routine that eliminates the potential for error. This provides greater standardization and consistency while improving the quality of data. Guarantee reproducibility every time with a Basic Script, no matter who is controlling the experiment. Basic Scripting not only allows control of the display and AcqKnowledge functions, it also allows the addition of customized messages and prompts. Create a standardized procedure and document it within a Basic Script. Customized instructions popup to inform the user when they have to perform a task, or when something is taking place. Scripts are extremely useful for automating and guiding the calibration process. Add automated prompts and instructions to simplify the protocol and provide additional guidance. Eliminate repetitive tasks and free up time for further analysis with the use of a Basic Script. AcqKnowledge is amazingly powerful and has a wide range of tools for filtering, transforming, measuring and analyzing the data, but performing the same task on every single file becomes very tedious. Use a script to eliminate repetitive and monotonous tasks that lead to errors and short cuts. Increased consistency and reproducibility will improve the quality of data generated from each experiment. Create fully automated analysis routines and combine several complex tasks into one simple script. BIOPAC Basic Scripting is used to create all of the AcqKnowledge analysis routines, which allows the user to customize and expand them further. The AcqKnowledge analysis routines provide useful building blocks for creating further analysis routines. Scripts are easily created within AcqKnowledge and do not require programming experience, but a familiarity with scripting will certainly help. The commands are documented in the online reference library and example scripts assist in the learning and development process. A support pack is also available that provides access to programmer support. Scripts are easily created within AcqKnowledge and can be added to AcqKnowledge Menus for easy implementation. Create scripts to increase productivity and conformity. Access routines scripted for AcqKnowledge Analysis Automation – ECG Classifier, Ensemble Average, Heart Rate Variability…dozens of powerful scripts can be used as is to mimic AcqKnowledge or modified from a particular protocol. BIOPAC Basic Scripting commands are documented in the online reference library and example Script Downloads assist in the learning and development process. Over 40 script downloads are available to be used for learning or as building blocks for basic display issues (create prompts, show/hide data), specific signal operations (fNIR channel analysis), and advanced analysis (HRV Metabolic analysis). Modify scripts for use on computers with an AcqKnowledge Scripting license. Use the Batch Acquisition feature to configure advanced experimental setups and acquire data from a sequence of templates. Each template in the Batch may have different acquisition settings, channel configurations, and stimulator setups. Use a BIOPAC Basic Scripting License to fully customize batch processing—see Script 36 online for sample batch directory files and BIOPAC Basic Script. Over 40 actions have been written to allow AcqKnowledge to be controlled from Automator workflows. Using these actions, workflows can be constructed to perform sequences of transformations, automating post-acquisition analysis, performing experimental protocols, and other repetitive operations. Use the “Workflow” menu to create, edit, and execute workflows directly from within AcqKnowledge. 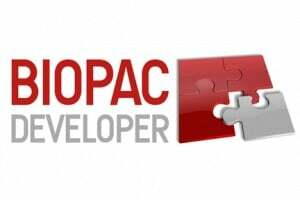 BIOPAC offers a variety of developer tools that can be purchased individually or in bundled packages—Scripting, Network Data Transfer, Hardware API, Software API get—all four with the Enterprise Bundle!